4.5 stars. I realized that I never wrote a review for this book. Unfortunately, trying to write one after the fact rarely works out. Details don't seem as sharp anymore, and you're sort of just giving a recap of thoughts, as jumbled as they are. 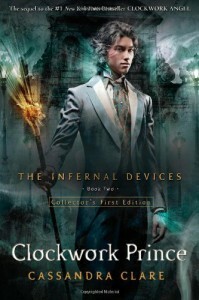 So you won't be getting too much from me out of this one.Clockwork Prince was even better than Clockwork Angel. I think that the ID series is going to pass the MI series for me because Clare's writing style seems to lend itself better to historical (steampunk). Details which I might have skimmed in a MI book are ones that I simply devour in ID. Even though the books don't really fall into the historical genre (you're not learning much about the time period other than day to day living details), I think they're not bad as a starter book for people who aren't used to reading books outside of the present day.The humor wasn't quite as up front and center in this book. In fact, there was only one quote funny enough for me to highlight this time around. Even with that part being sorely missed (her snarky humor is a treat), I enjoyed this book immensely. Here's where you should probably stop reading if you have no interest in who's the girl gonna pick? talk. As for the Jem & Will triangle...it appears that everyone seems to be sounding off about this on their reviews (it's kind of silly but whatever - I'll play the game!). I really don't have a front-runner, so here's what I'll say about the whole deal. Jem is one of the better male leads I've seen in YA fiction. He's not a frontrunner for being the best looking, the strongest, or the most alpha. He is simply a nice guy who isn't sitting in the background waiting to be walked on. Will is yet another misunderstood and tortured soul. He's not necessarily a bad boy, but because of his previous actions, he was sort of labeled as an arrogant jerk. Of course, we all knew there was more to this...but there you go. The label stuck. Who do I like? Both of them. Jem is the one I can't help but root for because he is so darn likable. Because Tessa is more drawn to Will and they seem to challenge each other, he'd be the one who I think is better suited for her. Being as that she's most likely immortal, maybe she won't end up with either.